Do you feel manipulated, controlled, or lied to? Are you the focus of intense, violent, and irrational rages? Do you feel as though you are constantly trying to avoid confrontation? If you answered yes to any of these questions, you should remember this: It’s not your fault. And you’re not alone. 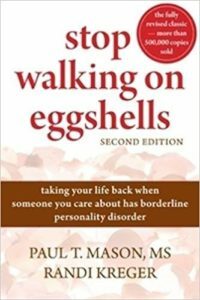 In fact, the person you care about may have traits associated with borderline personality disorder (BPD), such as emotion dysregulation, impulsive behavior, unstable sense of self, and difficulty with interpersonal relationships. No matter how much you want to be there for your loved one, at times it can feel like you are walking on eggshells. This compassionate guide will enable you to: – Make sense out of the chaos – Stand up for yourself and assert your needs – Defuse arguments and conflicts – Protect yourself and others from violent behavior.